The selection of the most appropriate power wheelchair base and the method in which to control it can be a daunting task. There are three main types of bases for power mobility; front wheel drive, mid-wheel drive, and rear wheel drive. The most common that we see if mid-wheel drive primarily for its ability to turn within its own access, so it has advantages in smaller spaces such as elevators, bathrooms or other small rooms. Rear wheel drive chairs are popular for users that use their chair outdoors on uneven terrain or want the highest speed or power they can get which is why you see that drive option in power hockey or power soccer. 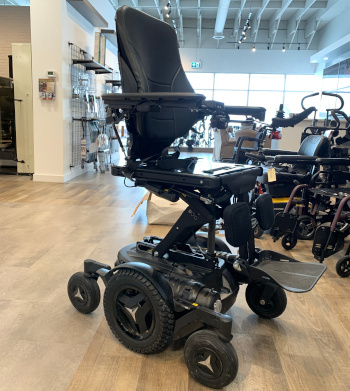 Front wheel drive chairs are not used as frequently in the Alberta market but are a good option for users that use their chair indoors and outdoors as it can tackle a variety of terrains. There are many methods of driving a power mobility outside of the standard joystick we all see on many devices. We are only limited by our imagination on how individuals can drive their chairs. Driver controls can be split in 2 categories; proportional and non-proportional. Proportional drives are your typical joystick control on many power devices out in the community. The amount of deflection of the joystick will determine how fast you can go, and you can slow down or speed up with how you move the joystick. You can also mount these controls and drive at the chin or head if the user is unable to control the chair with their hands. The non-proportional controls are essentially an on/off system and are switch devices. If you hit the switch you go but you cannot vary your speed. Non-proportional controls can be switches in the headrest (head array), or switches mounted anywhere else the user can access them (on a tray, footrest etc.). Technology is continuing to advance, and we are starting to see other methods such as eye gaze control. These devices are a great way for individuals to maximize their independence at home and in the community. Gary has been in the home health industry for over 10 years upon completion of his Master's degree at the University of Calgary in Muscle Physiology. Gary has been in many roles over the years starting as a Seating and Mobility Consultant and progressing to a Regional Management role. With Assist, Gary is excited about his new role that will enable him to work directly with clients again as well a focus on developing educational programs for our health care partners in the community. Gary has a passion for helping people live an active lifestyle and loves teaching.